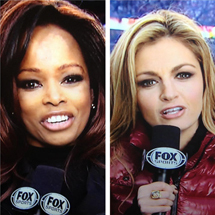 Hints of racism began to circulate when word spread that 20-year veteran Pam Oliver will be replaced her spot to Erin Andrews, whom the network hired away expensively from ESPN two years ago. Oliver is Black and Andrews is White and blonde. It’s unclear if Oliver’s comment is a veiled swipe at Andrews’ noted lack of journalistic heft or just some inside info on future plans. FOX executives seem aware of the easy optics created by the swap and the potential difficulties in justifying the elevation of the younger white blonde over the 53-year-old black woman with an established professional track record in the position. Their explanations, however, are undermined by a glaring logical contradiction. So that credibility-building effort is enhanced by removing the person he identifies as their best reporter from what is ostensibly their top job? Oliver was recognized as the highest-profile African-American woman in sports broadcasting, a fact that reminds us of the massive reach and strength of the NFL. Her bad hair day last January was in fact important enough to be a major story in black media, forcing her to respond to critics and raising troubling concerns about racial double standards for appearance created from both outside the black community and from within. As silly as it all sounds, it mattered because Pam Oliver carried symbolic significance, no matter what she was actually doing. But FOX needs to park Andrews somewhere that can possibly validate her acquisition, and this move helps promote her further out of harm’s way. To say she’s a lightweight would be taking it easy on her, as her level of discomfort has been obvious in any role so far, whether behind a desk or in a dugout. She just isn’t very good at anything and doesn’t offer much of a personality. One doesn’t have to be smart, interesting, clever or funny to generate pageviews, but the camera asks for more. Meanwhile, FOX pays Tony Siragusa to stand in the end zone and talk about local food, tell us that the fans are loud or that the field is increasingly slippery in a rainstorm, providing all the insight of a beef sandwich. He’s not a woman, so he’s not part of the conversation. The rules don’t apply to him.